A young boy named Lewis goes to live with his estranged uncle Jonathan after his parents die in a car crash. Lewis soon discovers that his uncle is a warlock and is searching for a doomsday clock that is counting down inside the walls of his house. Jonathan hopes to find this clock before it is too late. 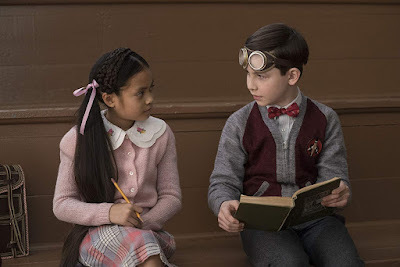 It is obvious from the get-go that "The House With the Clock in the Walls" is a film intended to give young kids a chance to dip their big toe in the pool of the fantasy horror style in a family friendly way before taking a dive headfirst into the gore and grit of the genre. This film is directed by Eli Roth, which is a bit of a surprise as he is better known for directing movies with grotesque body-horror like "The Cabin in the Woods," "Hostel," and "The Green Inferno." It is written by Eric Kripke and is based on the book by John Bellairs. This story centers on a young orphan named Lewis Barnavelt (Owen Vaccaro), whose parents recently died in an automobile accident. 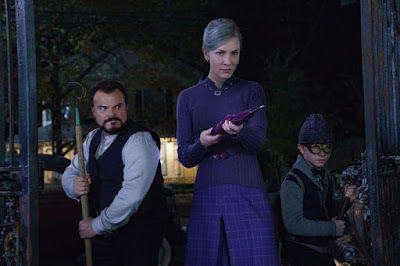 He goes to live with his estranged and strange uncle Jonathan (Jack Black). At first, Lewis thinks his uncle is just weird and that his house is super creepy, but he soon learns that Jonathan is a warlock and that Jonathan's neighbor/best friend Florence (Cate Blanchet) is a witch. With a little hesitation, Jonathan begins to teach Lewis magic but doesn't tell him everything that's going on, carefully omitting the one small detail about the doomsday clock that was built by an evil warlock named Issac Izard (Kyle MacLachlan) that could destroy all of humanity. This clock just so happens to be counting down inside the walls. Matters only get worse when Lewis uses a spell to accidentally bring that evil warlock back to life just so he can impress a boy at school to be his friend. Talk about a surprise! 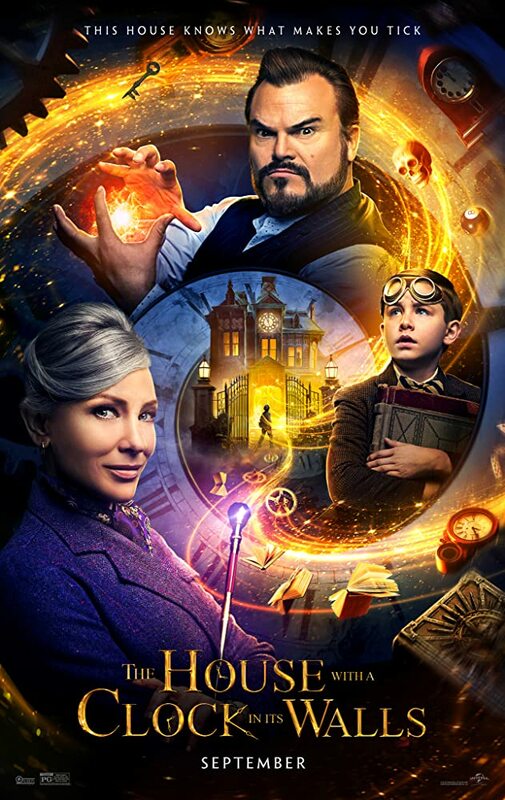 "The House with a Clock in Its Walls" is a fun and entertaining family adventure comedy that it much better than we thought it would be. We aren't used to seeing a movie directed by Eli Roth that doesn't include someone getting tortured or ripped apart, but he seems to have transitioned well into this more kid-friendly type of picture that maintains the spirit of the genre at a most basic level. This picture manages to have some horror elements, and Eli Roth succeeds in making this disturbing-adjacent. Jack Black gets to do his typical, run-of-the-mill Jack Black thing, only this time, he gets to wear a kimono and have some interesting facial hair while doing it. Black performs his role in a much more restrained manner than usual, but he is still plenty funny and doesn't take it too terribly far into the realm of obnoxious (which he has been known to do at times). Cate Blanchett is flawless as usual. We loved her performance and her character. As Florence, she is decked to the nines in all purple motifs, and she is one of the more compelling characters in the film. The most heartbreaking moments involve her and Lewis and their shared sadness and loss. Blanchett looks like she is having the time of her life in this much lighter role where she gets to wield a magic-laced umbrella and disparage Jack Black for almost two hours. Owen Vaccaro does a good job as well. He is really coming into his own as a kid actor! We will say, there is one scene where he is asked to cry, and it felt very forced to us. No matter, he will get there! The best part about "The House with a Clock in Its Walls" by far is the striking, intricate visuals. This is such a neat looking film. The enigmatic old mansion where Jonathan lives, the ever-changing stained glass portrait at the top of his staircase, the living jack-o-lanterns who reside year-round on the porch and eventually vomit up gooey pumpkin guts, the gorgeous gothic backyard full of fountains and living topiaries that act like housecats, and the room full of living toys that are surprisingly unsettling all get to play a part in this family fantasy near-horror as the house and all its living and non-living residents come to life in magical ways. We had a really great time watching "The House with a Clock in Its Walls." This is an excellent way to get your family in the mood for fall and for Halloween without scaring them too much. It can be dark at times, but the horror-esque elements are balanced out by sporadic running jokes involving a farting lion shrub or vomiting pumpkins. If you are looking for something that will keep your family entertained and just a little bit creeped out, you could certainly do worse than this magical flick.